This is why I love Chiang Mai. Today was a Good Day “Chiang Mai Edition” – YouTube. I have arrived. I am home. In the here. In the now. Yesterday I spent the evening with the Green Papaya sangha at the Yoga Tree in Chiang Mai. Around forty people where there, many regulars, some visitors like me. The sangha – a Buddhist term for a spiritual practice group – are in the Plum Village meditation tradition. A little different from vipassana meditation, which trains students to analyse their thoughts, Plum Village is more slanted towards engagement with the present moment. We did three sessions of meditation – one guided, one walking, and one silent sitting. For the walking meditation the meditation leader recited a chant to help pace our footsteps. Being in the here, in the now, is at the heart of – not just meditation – but all spiritual practice. But it is soooooooooooo hard! And another load of oooooo’s and it’s sill harder than that. The mind – my mind, your mind, our mind – isn’t very good at being where it is. It likes to be in either the past – remembering what has already happened – or in the future – imagining what is to come. If you have some spare minutes, sit quietly for a while and watch what your mind dos. Label the thoughts that arise. Are they of of the past? Of the future? Are you perceiving the present moment? You’ll find that very little of your time is spent in the here and now. What you remember of the past is not real, just a memory. What you imagine of the future is not real, just a projection of your hopes or fears. The only thing that is real is where you are, in the here, in the now. There is no past or future, just the ever changing now. The first time I encountered this idea was through the spiritual teacher Eckhart Tolle. It’s the pivotal idea in his now world famous book The Power of Now. But I heard it in a recording of a four day retreat conducted by Tolle, published as the Journey In To Yourself. I was 30 and, by any measure, deeply unhappy. I’d been pushing down a lot of horrible emotions from a damaging childhood, grief from many losses, and had trapped myself in a life I didn’t fit in to from a desperate need to fit somewhere, anywhere. I had no kind of spiritual practice at all. I was a standard issue atheist, and any encounter I had with religion was edged with inherited and unexamined scorn. Consequentially, I really had no tools to process the pain I was feeling. Today, my argument with the radical atheist rhetoric of people like Richard Dawkins and Daniel Dennett – both of whom I had read heavily at university – is that it leaves the bulk of its believers utterly amputated from their own emotional reality. It certainly had me. I was miserable, and in trying to escape from the causes of the misery I’d driven myself, repeatedly, to the borders of emotional collapse where I had, at long last, collapsed. So downloading a talk by an odd sounding German guy from Audible was probably, on the level of latent spiritual instinct, a last ditch attempt to pull myself out of a very dark place. For some reason I lay down on the floor of my apartment to listen to Eckahart Tolle’s characteristically odd voice as it pipped out of my laptop. And the next thing I knew, I was caught up in uncontrollable laughter…not that I was making any effort to control it. Not the laughter of scorn and anger that so much modern humour is rooted in. Not truly the laughter of humour at all. But the laughter of release. Massive, explosive, unexpected release, like a lock had been unpicked to the chain holding my emotions in place. And the key was Eckhart Tolle’s words about past and future, and our mind’s obessive need to escape to one or another, away from the present. Walking in meditation with the Green Papaya sangha I remembered that first moment of radical contact with the present. The first time I had arrived, home, in the here and the now. And in the studio of the Yoga Tree, I found myself there again. “Home” is a very good word for the here and now of the present moment. When you come back to the present, even for a second, and regardless of where you are, however foreign it may be, it feels like arriving back at home. It’s why I think meditation, yoga and other spiritual practices are so common among travellers. Once you have found the present moment, you carry your home with you wherever you choose to travel. It is easy to wander off the path and loose your home though. For some months after getting there, with the help of Eckhart Tolle, I felt elated, ecstatic, barely part of the world any more. Liberated, in a very real sense, from the sadness I had been carrying around. As I later discovered from the Buddhist teacher Jack Kornfield, this is a common period in a meditation practice. Inevitably, it is followed by a return to normality. I spent the next four years trying to understand that experience, reading widely about Buddhism and other spiritual paths, and learning to meditate. That period culminated on a trip to California in late 2011, where I spent most of three weeks meditating and running on the beach in San Diego. In the two years since then that spiritual practice and meditation have settled in to the background of my life. I’ve returned to more worldly pursuits, spending more time on my writing career again. Padding in circles at the Yoga Tree, I realised I had lost the moment for a long time. In day to day life it’s so easy to stay wrapped up in your memories and imaginings of past and future. It’s easy to sit down and meditate and spend an hour thinking through your hopes,fears and ambitions and never hit the here and now once. This is both natural and sad. It’s like being right outside the front door of your home, but never going in, staying on the cold steps outside instead. Last night, for a while at least, I came home again. There is a 21 day meditation retreat at Doi Suthep, the temple above Chiang Mai. Later this year, I’m going to go and do it. The poem above is by Thich Nhat Hanh. You could read it and an extended talk by the Vietnamese Buddhist teacher here. Which is a dangerous time for me. I have very little self-control when it comes to the kind sweet, tangy, fruit based deliciousness pomegranates promise. Which is a meandering introduction towards the revelation that I have just eaten two whole, very large pomegranates. The first one was good. Bright scarlet berries and a sweet flavour. But the second one. Oh lord. This was God’s own pomegranate. Dark crimson berries so juicy that as soon as I cut it open it seemed to be bleeding blood. And tangy, like a cherry crossed with a lime. One of the benefits of living in a diverse city like Leicester is that the residents know where to import the best fruit from. Wherever the current batch are imported from (I would guess Israel) the consequence is I’ve spent many evenings this week gorged out of my mind on fruit. As a good friend of mie says, a pomegranate is more than just a fruit. It’s an experience. But before you can get to that experience, you have find a way in. And as another friend says, the pomegranate is an intimidating fruit. The best pomegranates are dark skinned, almost scaly, and irregularly shaped. Avoid pale, shiny round pomegranates. They will be artificially grown in big greenhouses. The berries will be pale and tasteless so you just end chewing seed. And it will be mostly pith anyway (more on the pith later). Not good. It’s this kind of poor pomegranate experience, often from a supermarket bought pomegranate, that puts many people off. Size wise, a pomegranate should be around the size of an orange of a big apple. Smaller ones can be tasty, but frustrating (I would have to eat three small pomegranates at least) bigger ones again risk being artificial and tasteless. Assuming you can source a few good pomegranates, you are going to need a nice bowl and a good sharp knife. I use a paring knife with a short, fat blade. I’ve used a professional grade 12″ chopping knife in the past out of desperation, but as you will see, control is an issue. Oh, and somewhere comfortable to sit. And maybe some good music. 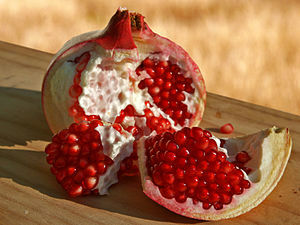 Carefully dig the tip of the knife under the evil looking stem on top of the pomegranate, then cut around in a circle. The aim is to cleanly detach this and dispose of it. It serves no further purpose. Now, you’re going to make a slicing incision from near the top of the pomegrante, down to around two thirds of the way to the base. YOU ONLY NEED TO SLICE THROUGH THE SKIN, NOT INTO THE FRUIT ITSELF. Now, make another identical incision about one sixth of the way around the circumference of the pomegranate. Make a third small incision to join the top of the two existing one. Imagine this as demarcating a slice of cake. With the slice ready, you use the edge of the blade to gently leaver it out of the body of the fruit. You should then get a whole chunk of berries attached to the rind. In a moment you’re going to be able to eat some berries. But first a note on pith. Pith is not, contrary to what my mother said the first time she gave me one of these fruit, lethally poisonous. You do not need to remove every single tiny bit of pith from every single damn berry, as I did, thereby extending the eating time to three or four hours. Pith is rather bitter and chewy however, so you do want to avoid it mostly. The best way to do this is to us your fingers to pick a cluster of berries off the slice and then eat them. Once you’ve finished a slice, you will want another one. Repeat the incision and levering / lifiting process until you’ve eaten the berries from all six slices. Then you can dig in to the main body, unless you’ve been eating those bits as you go, which is actually how I usually do it. The base of the pomegranate is rather wondrous. Assuming you’ve been methodical you will basically have a seventh, circular slice. Now, of you remove most of the pith, and then press the bottom upwards, the whole thing radiates out like some kind of pomegranate flower. Don’t admire it too long, it’s meant for eating. Now at this point I usually get a second pomegranate and continue eating. If that was the second pomegranate, I debate having a third, assuming there are any left and reminding myself I will DEFINITELY feel sick afterwards. Which is why I’ve been writing this post, as I consider that question. And now I have made up my mind. I very rarely comment on politics. I am by nature a non-political person. I tend to see both sides of most arguments, and there are merits and faults with any position in any political debate. Extremism is always wrong. Beyond that, who is right is mostly a matter of your tribal, partisan allegiances. There is no possible right in the brutal kick in the teeth delivered to young people, from all but the most privileged backgrounds, by todays disgraceful decision to force £28,000 of debt on to the shoulders of every student. There are many arguments for and against this decision. They are all fatuous. Because at the absolute bottom line, thousands of hard working and intelligent young people from ordinary backgrounds were told today that they simply aren’t worth investing in. That however well they do at school, they will not be able to get a university education unless they accept the heavy burden and very real risk of a £28,000 debt. Anyone who does not understand the terror that this level of debt induces in anyone from an ordinary background is simply displaying a staggering level of ignorance. The message this decision sends young people from ordinary backgrounds is that they should know their place. Society has a hierarchy, and really, if you seek to rise above your station you will have to pay the price. Every adult in this country should hang their head in shame for allowing the step by step erosion of our principles that has brought us to such depths. Young people are rightfully angry about this. They are right to burn and smash and riot in our streets. We really deserve no less. It’s my last night in St Ives. I’ve somewhat fallen in love with the place, and with much of Corwall (all the bits not Newquay). There is a storm coming in, and I’m sat on the headland overlooking Porthmeor beach, where there are thunderous white waves smashing onto the rocks and sand. This week has been a retreat of a kind. I have had the week entirely to myself, without a face to face conversation of more than a few sentences. And I’ve had a really excellent week. I’ve spent some time thinking about work, writing and life. Buy more importantly I’ve spent time not thinking about much of anything at all. Through the week I’ve been listening to Jack Kornfield’s Buddhism for Beginners. I’ve developed a system over the years of learning things backwards – starting with advanced texts and working my way backwards to introductory ones. I’m not what I would have made if the aeries of talks in Buddhism for Beginners I I had listened to them in isolation, but hearing them they hav helped to crystalise many ideas I’ve been slowly absorbing. I’ve been reading about Buddhism for much of the last year, and have had the slowly growing realisation that it’s become more than something I’m examining from a distance. Instead I find many of the ideas are becoming part of my day to day thoughts and practice. Part of my reason for coming away this week was to have space to consider some of those ideas in depth. I’m not exactly sure what that means yet. I have a good friend who often says I seem to be looking for something. I guess Buddhism and it’s ideas may be a part of that something. Tommorow I have a two hour bus journey to Newquay, then a flight then another bus journey to get me back to the East Mudlabds in tune for Alt.Fiction on Saturday. Maybe see you there! There is a conflict being played out in the Hepworth Museum. The entrance space is occupied with a display on Barbara Hepworth’s life, each major step in the process of her growth as an artist expalined and illustrated. It was a process of discovery and loss, the apparent permanence of her sculpture contrasting the transient nature of her relationships and life, which ended in a fire in her studio. The museum occupies the house and studio where Hepworth lived and worked. It is a clean and crisp white space, laid out much like a gallery of her work, but there is still much evidence of the artist – pieces of her furniture, her mantelpiece still in place. The sculpture garden itself is a zen Buddhist paradise. Hepworths monolithic forms are so fascinating to the eye that a few moments gazing brings on a trance like state of wonder, accompanied by the ever present screaming of the gulls that saturates St Ives. All of the sculptures have large signs nearby shouting PLEASE DO NOT TOUCH. All of the comments left by children say such things as, ‘Dear Miss Hepworth. I love the scultures but was terribly tempted to climb all over them!’ and it’s not just the kids, wherever you look you see hands being consciously restrained from touching the appealing stone and bronze surfaces. At the far end of the garden is Hepworth’s main sculpting studio, which has been preserved untouched for over 30 years, although from it’s cleanliness we guess someone hoovers out the cob webs now and again. The artist might have just stepped out for a few moments to by a new chisel. But how long can these sculptures, finished and half finished, remain preserved? What catastrophic event will bring time back into this space? Or will it be a thousand small events, each chipping away another piece of the whole. The life that created these sculptures was as transient as all lives. They came from that place of imagination where nothing is the same from one moment to the next. And yet here we all are, desperately trying to cling on to these things. Which might all just be a roundabout way of saying I think they should give over a few of the big sculptures for kids to climb on. In St Ives and wonderfully lost. All the winding cobbled streets are idosyncraticaly identical, and any attempt to navigate to any specific place is doomed to failure. The best solution I have discovered is just to wander randomly and enjoy what you stumble upon. And you always end up back at the harbour eventualy. I’ve found a great room, right over Fore Street which is the main stretch through the town, for only £20 a night! It’s run by a real old Cornish couple who are incredibly sweet. However, at such a bargain rate I’ve been wondering if perhaps they lure unsuspecting Outlanders, butcher and sell them for meat. Unlikely, but should this be the last you hear from me then you have some clues as to my fate. I cheated and took the bus to St Ives. Even if I had stayed in St Agnes it would have been way to far to walk in one day. I’m glad I did, I like St Ives a great deal and I’m glad I’ll be able to spend a few days here. Also, my terrible, unwaterproof Merrell shoes are still soaking wet. My family has a history with St Ives. My mother, at the age of 19, worked a season as a maid in a hotel in the town. I imagine it was hard work but she rembered it fondly, and when I was about 10 we (my mum, my big sister and me) came for a holiday here two years running. I remember Porthmeor beach being enourmous, but it is really quite dinky, and certainly dwarfed by the magnificent Perran Sands. Because they are golden sand beeches however, when the tide is in the sea is glittering turquoise like a tropical island. When my mother came here to work (that would have been around 1959 / 60) St Ives was an artists haven. A far flung outpost of bohemia by the sea, which would have suited mum very well as she would have just finished art college then I think. St Ives is not quite bohemia any more. As often happens, artsists give a place bohemian cool, people come to experience it, prices shoot up and the penniless artists have to find other places to be. (I think this could happen in Leicester over the next decade or so, in a very different way.) The art in St Ives now is beautiful, decorative and safe. Now it’s really a tourist town, and sells the kind of art tourists like, in which regard it reminds me a great deal of Sorento. I’m going watch the sunset on the beech now and maybe write. Tommorow another cliff walk on a circular path perhaps. So. My Merrell walking shoes are not waterproof. In fact, my one year old Merrell walking shoes (I’m going to keep mentioning the brand in the hope of shaming them) today did a good impression of a pair of sponges, relaying every ounce of nearby water directly to my socks. I woke this morning to rain, and a weather forecast of solid rain all day. But I was not detered, and set off on the second leg of my walk. The path to St Agnes is only four miles, and including all the ups and downs and ins and outs I did it in about three hours. It’s a very pretty walk, with many abandoned mines and various crumbling buildings en route along the cliff tops. Unfortunately after the first half hour I noticed that my feet seemed damp. Half an hour after that and they were absolutely soaked through, and every step came with a squelching noise. Fortunately the walk kept them warm enough, but that meant I couldn’t rest for any length of time as they would have frozen. So I eventualy arrived in St Agnes absolutely exhausted and very uncomfortable, as the rain had also soaked my trousers and penetrated through my light waterproof coat. St Agnes seemed very nice, but also very shut, almost abandoned. After lunch in a pub and a change of clothes I took a look around and hunted around for the beech, but it is actually a few miles from the town itself so decided against it. I decided then to hop the bus back to Perranporth (which put my walk into perspective as it took all of 5 minutes!) thinking I could take another walk along the beech but am wishing I had not now, simply because I feel I’ve lost momentum on my walk. Perranporth is very nice but I’m sure St Agnes would have been as well given more of a chance. So I’m a bit disappointed with myself for not sticking to the plan…bah! If the whether is good tmrw I might take the bus half way to St Ives and then walk the final half. I can then stay a night of two there then do a final night in St Agnes or Perranporth before flying back. Despite the rain I did enjoy the walk today. Progressing along the cliff path is very satisfying and at times it seems amazingly remote and isolated. Every turn reveals a completely new and unexpected sight. I hope I get to discover some more of the path tommorow. Today I built a sand castle. Having a beach full of sand to play with proved to be quite a distraction from writing and from the book I was reading. (Lanark, which I am really enjoying again after getting distracted from it by general work related business.) I was idly digging one hand in the sand whilst reading, the next thing I knew I had made a small tower. Two hours later I had a whole complex of towers, moats, defensive walls and pebble battlements. Yes, I know. Sand castle construction has some basic principles. You dig a hole, you get a mound. The material from the hole has to go somewhere after all. Holes and mounds, the two basic building blocks of the sand castle. Extend the whole and you get a trench and a wall. Dig the trench in a circle and you have a moat. Pile a mound higher and you get a tower. Walls and trenches, moats and towers. Intermediate sand castling. Start combining these elements together and you are in advanced castling territory. The thing about sand castles is that you can start building them without any training or study. A six year old can learn most of what there is to know about sand castles in a single afternoon of play. Sand castles are the outcome of unlimited sand, imagination and a playful spirit. Much like stories. You do not need lots of learning and study to tell a good story. We tell ourselves and each others stories all the time. And as soon as you start telling a story, you start inventing characters and situations, which quickly become relationships and narratives. The basic building blocks that all stories are made from are as simple to discover as holes and mounds in the sand. But they are also easy to loose sight of. Imagine if I had gone down to the beach today with the image of Windsor Castle in mind and tried to build it. Or spent seven years studying architecture then tried to apply those principles on the spot. Or worse yet, tried to build a castle that represented the existential nature of the human condition. Argh!! Failue and frustration!! But that is exactly what we do as writers all the time. Stories can achieve all kinds of sophisticated and abstract outcomes (as too can sand castles). But however sophisticated, all stories are still made from the same basic building blocks, characters and situations, holes and mounds. It’s so easy to lose sight of those basics, and with them lose the imagination and playful spirit that make storytelling possible at all. The other thing that sand castles and stories have in common is impermanance. Stories last as long as the telling, although the memory of them may linger. Sand castles are gone with the tide, as I am sure mine has by now. I am on holiday. I might might not have mentioned this yet. So there…now you know. 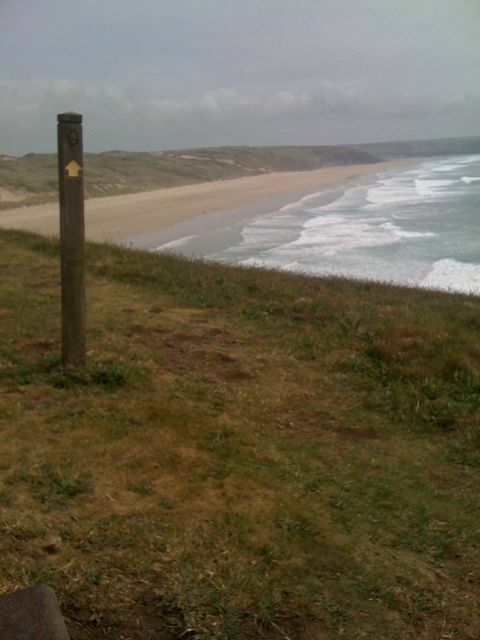 I set off from Newquay on my journey southward around the Cornish coastline. Newquay is not my kind of town. Picture the clubbing district of a grim industrial city, complete with classily named clubs like Silk, Envy and Charisma. Take that picture and drop it in isolation beside the sea. Populate it with a few thousand drunk and pilled up stage and hen parties. That is Newquay. Here and there are the signs of a genuinely interesting and alternative surfing town that might have existed a few years ago, but it’s been overwritten by mindless club culture. So I got up early this morning and started along the coastal path with Parrenporth as my goal. And boy am I glad I started early because as I write now I’ve just arrived at my goal after walking ALL DAY. I’m utterly knackered and recovering with a drink as the sun sets over Perran Beach. The coastal path is a walk of many dimensions. First is the up and down. My friend Dennis said he did not remember there being a single flat bit the whole way around. And from what I’ve seen he is right. And I’m not talking gentle gradients here, I seem to have spent at least a quarter of the day climbing up sheer cliff faces (only a slight exageration) or stumbling down paths modelled on very long playground slides. And then there is the in and out. There is nothing more demoralising than turning a corner to see that the last hour of walking has done nothing more than take you in a giant loop around a bay. But there is also a real satisfaction to actually arriving at a destination on foot. In this age of motorised transportation all destinations are easily reached. It’s only when you walk that you realise how far apart places really are. I bought the right bag, and packed the right things. It isn’t too heavy but I have basically what I need. We’ll see how I fell about it by the end of the week. My walking shoes, while the right thing, are already taking a beating. This pair are over a year old but seemed in good working order. However I’ve worn through an area of padding just today and it was starting to rub by the end of the hike. So, gaffa tape and Vaseline tmrw! Avoid nettle traps! A very narrow path left me with stings over my shins and forearms. Fortunately not too painful but not what you want when you’re miles from anywhere. I am taking a rest day tommrow. Perranporth is MUCH nicer than Newquay, with one of the most magnificent beaches I’ve ever seen, even rivaling Blacks Beach in San Diego, so I’m going to spend the day walking it tommorow and writing. (Photo below) After that a short hop to St Agnes, then maybe a LONG hop to St Ives. Oh…I also have no idea how I get back from wherever the walk ends to Newquay and the airport. Ideas gratefuly received.